US-China Today spoke with Dr. Geng Song about changing ideas of masculinity in East Asia and implications for China’s soft power. 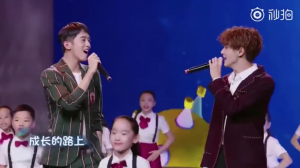 In September 2018, social and news media erupted with controversy regarding state broadcaster China Central Television’s annual back-to-school gala. The main point of contention was the effeminate aesthetics of the band New F4, who featured prominently within the nationally-televised broadcast. 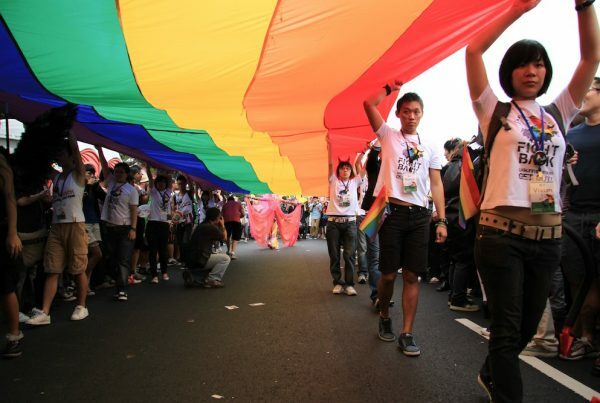 Xinhua, a prominent state newspaper, published an editorial claiming that effeminate male celebrities are “having an inestimably adverse impact on teenagers.” Both social media and other traditional outlets joined in on the growing conversation, with People’s Daily publishing a stalwart defense of newly popular feminine aesthetics. 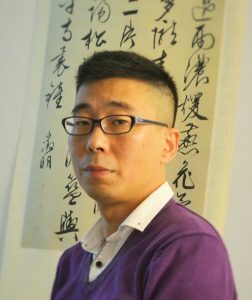 US-China Today interviewed Dr. Geng Song of The University of Hong Kong, whose work deals with gender imagery in China and abroad, as well as media and national soft power. His most recent book, The Cosmopolitan Dream: Transnational Chinese Masculinities in a Global Age, is available from Hong Kong University Press. So first, you’ve written extensively about popular portrayals of masculinity in China. How and why have these changed in recent years, in your opinion? Well I think there are several new trends, one of them the so-called “pan-East Asian soft masculinity,” because of the influence of the Korean wave and K-Pop, TV dramas, and also Japanese pop culture. Recently there’s been a debate on China’s social media about effeminacy in young men. It was sparked by a performance by a boy band known as the “New F4,” who performed on CCTV on China’s official national television. Many parents were angry because they found the image too effeminate, but this type of image is very popular among teenagers and young people in China. I would say that masculinity is becoming more and more diversified in China. For instance, in popular culture nowadays you can also find queer expressions and effeminate types of men, which have been taboo in China in the past. Also there are TV dramas where you can find the “tough man,” the superhero type of man, [such as in the recent film] “Wolf Warrior 2.” (Read our 2017 story on “Wolf Warrior 2” screenings in San Gabriel Valley here.) So masculinity has been closely linked with nationalism and patriarchal politics. This type of tough man or patriotic man still has its currency today. But it’s becoming more and more diversified, and showing influence from not just the Western type of “new man” image, but also the popular culture from Japan, Korea, and other East Asian countries. So that first, that sort of effeminate man aesthetic that you described, would you say that’s the same thing as the 小鲜肉 phenomenon? It’s quite similar but I don’t think they are exactly the same thing. From my understanding, 小鲜肉, or the “little fresh meat” is a term coined by women. Basically, it’s from a woman’s perspective. So 小鲜肉 implies a sexual objectification of men: man’s body as “meat.” As something you can consume, something you can desire for. And I think the first appearance of this term is from women’s discussions of men. So this shows empowerment of women. Because traditionally men are the mind, women are the body. Women is the bodily existence. Men talk about women’s bodies, but women cannot talk about men having a bodily existence. Back in September 2018, Xinhua published an editorial denouncing the sort of feminine masculinity. I believe it was in reaction to a gala that was shown to both parents and children, which featured the “soft” masculinity extensively in cosmetics advertisements. 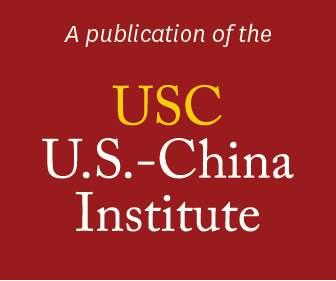 And the editorial, which was signed by the editorial board, claimed “this particular style is having an inestimably adverse impact on teenagers.” Reacting to that, what moral and cultural effects do you think, if any, these changing ideas and the emergence of “soft” masculinity is having in China? There was a performance of a “girlish” boy band in that TV program which sparked criticism, especially from the parents, about this effeminacy of men. I think it’s a very complicated phenomenon. In this debate we can hear multiple voices, not just the criticism, but also a defense of it, from scholars but also from media outlets like People’s Daily. There are articles arguing that we should be more open-minded, that the standard of masculinity should be diverse, and also that we should not judge a person according to his or her appearance. I think this is a good thing. It shows that even the government or the authorities are adopting a more open and tolerant attitude towards gender diversity. I think one thing that maybe is birthing more discussion is the link between gender and nation. Gender has been a hot issue—in America, in Europe. But I think nowhere like in China is gender so closely linked to the nation. At the center of the discussion is whether this effeminate image is good for the nation or not. The people who oppose effeminacy [are] arguing that effeminate young men means an effeminate China. So this is linked to the virility of the nation. 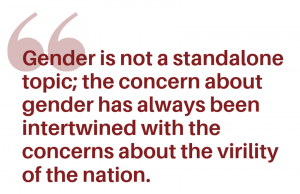 Gender is not a standalone topic; the concern about gender has always been intertwined with the concerns about the virility of the nation. So it’s about how we’d like our next generation to be. What do you imagine the interest of the Chinese government is in controlling presentations of masculinity, and do you think in the future that they will continue to let it evolve along this [current] line or perhaps try to revert to a more traditional definition of masculinity? It’s hard to say. For instance, I’m doing research on television [which] in China is state-controlled. There’s no such thing as independent TV stations in China and there’s a very heavy-handed process of censorship. TV programs show a negotiation between the state and the individual because the state will only approve the images that they like. But television is also highly commercialized and a highly profitable undertaking. So if you make a TV drama series, and then you sell it to TV stations, the revenue generated from advertisements could be huge. So this is both politically controlled and also commercially oriented. For instance, the anti-Japanese hero is a very popular hero in Chinese TV dramas. You can say this is [the work] of the government. The government will endorse this type of patriotic man because they want people to have this education, this patriotism. But if it’s just the result of top-down propaganda then you cannot explain why this is commercially so successful. Because the government will not pay for TV drama production if you cannot sell it. So the producers, they must make sure that number one, [that] this is politically safe—the government will approve it—but number two, [that] this will be positively received by the audience. I think it’s hard to say what type of image is promoted by the government. I think the nationalist type, the patriotic type would be preferred by the government. But at the same time, it seems to me that another type of man that TV programs promote is the cosmopolitan man. These people speak very good English, they’re educated in the West, they have no problem at all communicating with foreigners, and they’re well-versed in Western culture. So this cosmopolitan reflects a more open and stronger China. I feel that this [cosmopolitan image] is also welcomed by the government. Maybe if the image is too effeminate the government will intervene and they will stop the showing of this type of image. For instance, gay masculinity is still a very grey area. In some TV programs, you can find this very discernable queer expression, but it’s not explicitly homosexual. The state-sanctioned discourse on masculinity is heterosexual, [with] the so-called “normal” type of man who shows responsibility to the country and family. Since appreciation of “soft” masculinity comes largely from both Japanese and Korean media and social media, what implications do you think that has for China’s soft power in relation to those countries and in general? The Chinese government has expressed concern about young people being too heavily influenced by Korean and Japanese popular culture. A few years ago the government took action [due to] national defense issues to ban Korean music and K-pop. One of the concerns [was] this soft power deficiency, because people are being too heavily influenced by [Korea and Japan]. The Chinese government is very anxious nowadays to increase China’s soft power—like through the Belt and Road Initiative—and they’ve spent a lot of money to translate Chinese literature and TV programs into the languages of the Belt and Road countries. They sell Chinese TV programs to countries like Vietnam, and African countries. So the masculinity issue is also a struggle or competition over soft power. It seems like the balance of soft power is largely with Korea and Japan, where their ideas of masculinity are influencing China to a much greater degree than China is influencing theirs. Why do you think that disparity exists? Well, there’s one argument widely circulated in China, that “soft” masculinity actually isn’t originated in Japan and Korea because it can be traced back to a shared heritage by Korean, Japanese and Chinese culture, which is the Confucian scholar type of masculinity. But I’ve talked with many Korean colleagues and they disagree, [soft masculinity] has nothing to do with China and Confucianism. But if you talk with Chinese people many of them would say we have been influenced by the Korean wave or the TV dramas but if you trace it back to the tradition, [it explains why] East Asian countries are particularly interested in this type of effeminate or scholarly image, that’s because we have a shared heritage of masculinity. So how do you see that disparity of soft power and of cultural influence developing in the future? Well China’s soft power has been increasing at a very fast pace. For instance some TV series like the recent TV drama on the Qing dynasty palace has been translated into many [languages] and in South Korea, it was warmly received. In the near future, you can predict that China’s soft power will be rising. But at the moment I cannot see any type of male image that is particularly appealing for non-Chinese audiences. It has not yet emerged, but maybe in the future there will be some type of Chinese man which will become very popular in the West. If you talk with Western people about Chinese men the image in their mind is Bruce Li and Jackie Chan, that’s it. Can they name any Chinese pop stars? Chinese male stars? I don’t think they’re familiar [with them]. So at the moment I don’t think I don’t think China has any powerful influence on other cultures in terms of masculinity. But, who knows? China is so keen to increase its soft power and invests such a large amount of money into it, and also along with more and more Chinese people coming to the West, and migrating and studying in other countries. I recently co-edited a book with Derek Hird, titled “The Cosmopolitan Dream: Transnational Chinese Masculinities.” It is an edited volume, so we’ve gathered a dozen articles and chapters on Chinese men in Japan, Chinese men in Germany, in Hong Kong, and North America. It was just recently published by Hong Kong University Press, so definitely check it out.